Early mortality and overall survival in oncology phase I trial participants: can we improve patient selection? Patient selection for phase I trials (PIT) in oncology is challenging. A typical inclusion criterion for PIT is 'life expectancy > 3 months', however the 90 day mortality (90DM) and overall survival (OS) of patients with advanced solid malignancies are difficult to predict. We analyzed 233 patients who were enrolled in PIT at Princess Margaret Hospital. We assessed the relationship between 17 clinical characteristics and 90DM using univariate and multivariate logistic regression analyses to create a risk score (PMHI). We also applied the Royal Marsden Hospital risk score (RMI), which consists of 3 markers (albumin < 35g/L, > 2 metastatic sites, LDH > ULN). Median age was 57 years (range 21-88). The 90DM rate was 14%; median OS was 320 days. Predictors of 90DM were albumin < 35g/L (OR = 8.2, p = 0.01), > 2 metastatic sites (OR = 2.6, p = 0.02), and ECOG > 0 (OR = 6.3, p = 0.001); all 3 factors constitute the PMHI. To predict 90DM, the PMHI performed better than the RMI (AUC = 0.78 vs 0.69). To predict OS, the RMI performed slightly better (RMI ≥ 2, HR = 2.2, p = 0.002 vs PMHI ≥ 2, HR = 1.6, p = 0.05). To predict 90DM, the PMHI is helpful. To predict OS, risk models should include ECOG > 0, > 2 metastatic sites, and LDH > ULN. Prospective validation of the PMHI is warranted. The primary objectives of phase I trials (PIT) are to define the toxicity profile of a new drug and to determine the dose for further evaluation in phase II trials. Patients enrolled in PIT are therefore placed at risk of toxicity, in exchange for an undefined and limited clinical benefit. Furthermore, patients who are considered for PIT may be regarded as vulnerable because their physical condition may be deteriorating due to advanced malignancy for which no standard treatment options exist. Selection of appropriate patients for entry onto PIT is therefore critical for patient safety and to achieve study aims. Eligibility criteria are used to minimize risk in study participants and avoid factors that might interfere with determining causality of adverse events. Typical study entry criteria include reasonable performance status, adequate organ functions and an anticipated life expectancy of greater than 3 months. Retrospective reviews by large phase I groups have demonstrated that approximately 25% to 33% of patients do not meet the necessary eligibility criteria at screening [1, 2]. In addition, up to 20% of patients die within the first 90 days of PIT entry [3–5]. These early deaths on study are usually attributed to disease progression, as contemporary PIT are safe with a toxic death rate of around 0.5% [3, 6–9]. Therefore, the current eligibility process to screen patients may be inadequate, and an objective and reproducible tool is needed to improve patient selection. To address this need, several single-center, retrospective studies were performed to identify the predictors of survival in patients on PIT [3–6, 8–10]. The most recent effort has been the development of a prognostic score to predict survival of patients treated on PIT, [3, 4] which was prospectively validated at the Royal Marsden Hospital in the United Kingdom . Derivation of the score was based on a retrospective study of 212 patients treated on PIT at the Royal Marsden Hospital between 2005 to 2006, which revealed in multivariate analysis that the following items were significant independent covariates for poor overall survival (OS): elevated LDH, low albumin and more than 2 sites of metastases . The 3-point prognostic score consisted of normal LDH versus LDH > ULN (score = 0 versus +1), albumin ≥ 35 g/L versus albumin < 35 g/L (score = 0 versus +1), and sites of metastasis ≤ 2 versus > 2 (score = 0 versus +1). In the retrospective study, nearly 90% of patients who died within the first 90 days of study treatment had a risk score of 2 or 3. The authors prospectively validated the prognostic score at the same institution in 78 patients treated in 19 PIT from March 2007 to June 2007 . A significant difference in median survival was again observed for patients in the good-prognosis group (risk score 0 to 1, 33 weeks; 95% CI 24-42 weeks) compared to the poor-prognosis group (risk score 2 to 3, 15.7 weeks; 95% CI 11-21 weeks), and thus the prognostic score was an independent marker for OS (HR = 1.4; p = 0.037; 95% CI 1.02-1.9). The Royal Marsden Hospital Index (RMI) has been validated at other centers in Europe,  however the utility of the RMI in North America is unknown. We performed a retrospective analysis of patients enrolled in PIT at the Princess Margaret Hospital (PMH) over a period of 3.5 years. The goals of the study were: (1) to identify predictors of 90DM in our cohort; (2) to identify predictors of OS; (3) to validate the RMI in a retrospective cohort of patients treated in our institution; and (4) to compare the performance of RMI to that of our index (PMHI) in our cohort. Patients were selected from the PMH Phase I Trials Database, a registry of all patients enrolled on solid tumor PIT at PMH, and included 271 consecutively treated patients who had received at least one dose of treatment, from 1 January 2006 to 1 July 2009. Patient characteristics and vital status were obtained from the PMH Phase I Trials Database, individual patient charts, the PMH Cancer Registry and the Ontario Cancer Registry following approval from the University Health Network Research Ethics Board, the PMH Cancer Registry Database Access Committee and Cancer Care Ontario. Descriptive statistics were used to summarize the study cohort. All baseline characteristics were examined in univariate analysis as predictors for 90DM and OS using logistic regression and Cox proportional hazards model respectively. Only those which were significant at the 0.10 (two-sided) level in the univariate analysis were entered into the exploratory multivariate analysis, and variables that remained significant at 0.05 (two-sided) level in the multivariate analysis were considered significant prognostic factors. For each individual, the RMI score was also derived from the sum of the three components used in the prognostic model established by the Royal Marsden Hospital . Patients were subcategorized into two groups for the RMI: total score of 0 to 1 (good risk group), and 2 to 3 (poor risk group). The Kaplan-Meier method was used to estimate OS and the log-rank test was used to compare survival curves. The receiver operating characteristic curve was used to measure the discrimination of 90DM by different prognostic indices. The overall concordance index (C index) was used to measure the discrimination ability for the survival analysis models generated by the PMHI and RMI, with a value of 0.5 having no discriminative ability and a score of 1.0 having perfect discriminative ability . Statistical analyses were performed using the SAS 9.2 program (SAS Institute, Cary, NC). For the analysis of 90DM, we excluded 38 patients (11%) from the cohort of 271 patients enrolled on PIT for the following reasons: primary diagnosis of hematological malignancies (n = 22) and missing data (90DM (n = 5), performance status (n = 10), number of metastatic sites (n = 1)). The baseline patient characteristics of the remaining 233 patients are presented in Table 1. Median age was 57 years (range: 21-88); 53% were male; the majority had an Eastern Cooperative Oncology Group (ECOG) performance status of 1 (52%); and the median number of previous treatments was 2 (range: 0-14). A variety of cancers were represented; the most common was gastrointestinal origin (46%). Overall, 59% had 1 to 2 sites of metastases (median 3, range: 1-4 sites). The most common sites of metastasis were the lung (55%), liver (52%) and bone (17%). The majority of patients were treated with a combination of molecularly targeted and cytotoxic chemotherapeutic agents (58%); 38% were treated with molecularly targeted agents alone. Baseline biochemistry revealed a low albumin (albumin < 35 g/L) in 3% of patients, and elevated LDH (LDH > ULN) in 39% of patients. In terms of blood counts based on conventional laboratory thresholds, hemoglobin of less than 12 g/dL, white blood count of more than 10.5 × 109/L and platelet count of more than 400 × 109/L were present in 39%, 13% and 12% of patients, respectively. Patient outcomes are described in Table 2. The 90DM in our cohort was 14%. The median survival was 320 days (range: 270-365 days) with a median follow-up time of 224 days (range: 23-1345 days). There were no reported toxic deaths. Of the 233 patients, 196 (84%) were evaluable for objective response by Response Evaluation Criteria in Solid Tumors (RECIST) . The best overall response by RECIST was partial response (PR) in 17 patients (9%), stable disease (SD) in 92 patients (47%), and progressive disease (PD) in 87 patients (44%). The clinical benefit rate (PR + SD) was 56% (109 patients). Of those who achieved SD, the majority had a SD duration of 3-6 months (54%) and about one quarter had SD for over 6 months duration (23%). The results of the univariate and multivariate analyses to investigate predictors of 90DM are shown in Table 3. 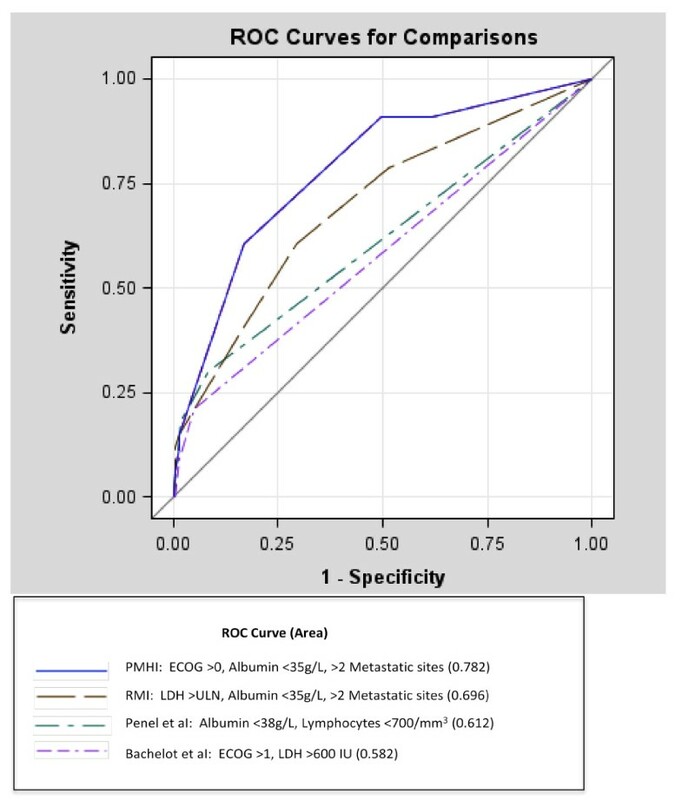 In multivariate analysis, we found that albumin < 35g/L (p = 0.008), > 2 metastatic sites (p = 0.02) and ECOG > 0 (p = 0.001) were significantly associated with 90DM in our cohort. Using these 3 variables, a risk score was constructed and evaluated (PMHI). One point was assigned to each of the 3 variables. For PMHI score of 0-1, the 90DM rate was 7%, whereas a score of 2-3 was associated with a 90DM rate of 37%. We then evaluated the RMI developed by Arkenau et al. , which consisted of albumin < 35 g/L, > 2 metastatic sites and elevated LDH. When applied to our cohort, univariate and multivariate analyses demonstrated that albumin and > 2 metastatic sites were significant predictors of 90DM; albumin < 35 g/L (OR 8.13 95% CI 1.72-38.37, p = 0.008) and > 2 metastatic sites (OR 2.32, 95% CI 1.02-5.28, p = 0.05). However, LDH was not a significant predictor of 90DM in our cohort (OR 1.58, 95% CI 0.69-3.60, p = 0.28). When RMI was applied to our cohort, the 90DM rates were 11% for a score of 0-1 and 29% for a score of 2-3, respectively. Finally, we compared the test characteristics of the PMHI and RMI in predicting 90DM using a dichotomized score (0-1 vs 2-3) (Table 4). A PMHI score of 2-3 had an OR of 7.24 (95% CI 2.91-18.02), p < 0.0001. A RMI score of 2-3 had an OR of 1.08 (95% CI 0.41-2.89), p = 0.88). The sensitivity of the PMHI for predicting 90DM was 61% with a specificity of 83%. The sensitivity of the RMI for predicting 90DM was 36% with a specificity of 85%. The area under the curve was significantly greater for the PMHI (0.782) compared with the RMI (0.696, 95% CI 0.597-0.794, p = 0.02), or with other indices such as those published by Penel et al. (0.612, 95% CI 0.515-0.709, p = 0.001) and Bachelot et al. (0.582, 95% CI 0.509-0.654, p = 0.0002) (Figure 1). Receiver operator curve for comparison of PMHI, RMI, Penel index and Bachelot index for predicting 90 day mortality. The results of the univariate and multivariate analyses to investigate predictors of OS are shown in Table 5. In multivariate analysis, we found that high LDH (p = 0.001), > 2 metastatic sites (p = 0.004) and ECOG > 0 (p = 0.05) were significantly associated with OS in our cohort. When the PMHI was applied to predict OS, number of metastatic sites was the only significant predictor (Table 6). By contrast, when using the RMI, both LDH and number of metastatic sites were significant predictors of OS (Table 6). The C index for the PMHI is 0.89 (95% CI 0.76-0.98). The C index for the RMI is 0.87 (95% CI 0.73-0.96). The median OS according to PMHI and RMI risk score is presented in Table 7. *too few patients in this stratum to provide a stable 95% CI. Overall, the RMI performed slightly better than the PMHI in predicting OS. A RMI score of 2-3 had a HR of 2.18 (95% CI 1.33-3.58, p = 0.002), while a PMHI score of 2-3 had a HR of 1.58 (95% CI 1.01-2.47, p = 0.05). The Kaplan-Meier survival plot by PMHI score category (0-1 vs 2-3) is illustrated in Figure 2. Patients with PMHI score of 0-1 had a better OS (median OS = 250 days, 95% CI 299-414 days) compared to those with PMHI scores of 2-3 (median OS = 237 days, 95% CI 87-270 days) (log-rank test, p < 0.0001). The survival plot by RMI score category (0-1 vs 2-3) is illustrated in Figure 3. Patients with RMI score of 0-1 had a better OS (median OS = 353 days, 95% CI 315-445 days) than those with RMI scores of 2-3 (median OS = 137 days, 95% CI 104-223 days) (log-rank test p < 0.0001). Kaplan-Meier plot of overall survival by PMHI score 0-1 vs 2-3 (HR 1.58, 95% CI 1.01-2.47, p = 0.05) (log-rank test p < 0.0001). 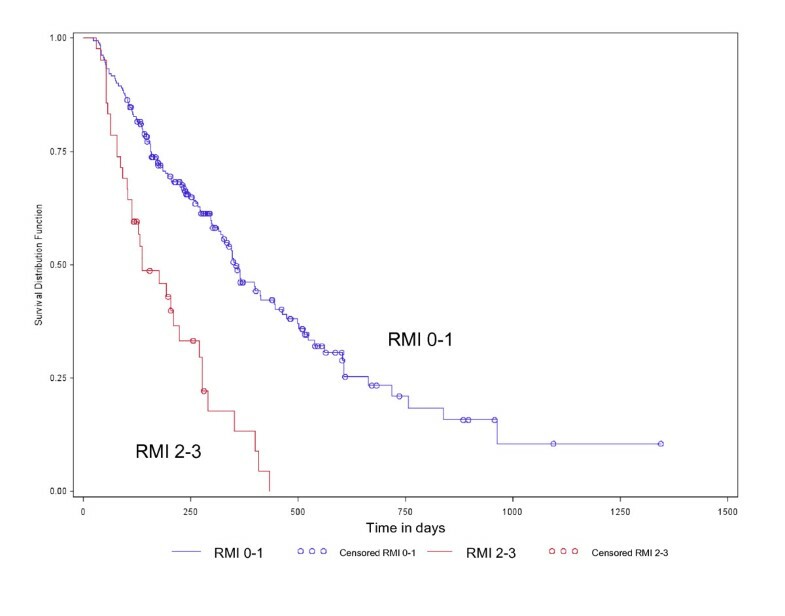 Kaplan-Meier plot of overall survival by RMI score 0-1 vs 2-3 (HR 2.18, 95% CI 1.33-3.58, p = 0.002) (log-rank test p < 0.0001). OS was associated with best response by RECIST. Patients with PR had a median OS of 603 days (95% CI 433-756), patients with SD had a median OS of 501 days (95% CI 365-838), and patients with PD had a median OS of 158 days (95% CI 131-205) (log-rank p < 0.0001). Patients with a longer duration of SD had a significantly longer OS. Patients with SD for more than 6 months had a median OS of 561 days (95% CI 412-not reached), patients with SD for 3-6 months had a median OS of 414 days (95% CI 346-not reached) and patients with SD for less than 3 months had a median OS of 185 days (95% CI 135-538) (log-rank p < 0.01). Patients with SD for 3 cycles or more had improved OS (median OS = 538 days, 95% CI 400-719) compared to patients with PD or SD of 1-2 cycles (median OS = 171 days, 95% CI 136-204) (log-rank, p < 0.0001). In addition, OS appeared to be similar for patients with SD for 1-2 cycles (median OS = 171 days, 95% CI 78-not reached) and patients with PD (median OS = 158 days, 95% CI 131-205) (log-rank, p = 0.25). Selection of patients in oncology PIT remains controversial with often unclear benefit at the cost of potential patient risk [15–17]. Consistent with other studies, [3, 4, 6–8, 11, 18] we found a 90-day mortality rate of 14%, while treatment-related deaths were extremely rare (0% in our study). This suggests that early mortality is largely due to cancer progression and it has been proposed that the current patient selection process may be improved with the use of objective selection criteria. We showed that albumin, number of metastatic sites and performance status are independent predictors of 90DM. The PMHI was superior in predicting 90DM in our patient population, when compared to other risk indices designed to predict mortality in oncology PIT patients [3–6, 9]. One explanation may be that a model generated from a single institution's data set will likely perform best in the same institution, compared to an alternative model generated from an external data set. Secondly, the PMHI is derived from predictors of 90DM, which is a clinically relevant and distinct endpoint compared to OS. Whereas, the RMI, which was derived from predictors of OS was superior in predicting OS in our cohort. Thirdly, other risk indices designed to predict 90DM are based on heterogeneous patient populations, including those treated over 10 years ago. Bachelot et al. evaluated 154 patients enrolled in phase I trials from 1986 to 1993 and identified two independent risk factors for 90DM (LDH > 600 IU and ECOG > 1). Penel et al. analyzed 148 patients who were screened for phase I trial entry from 1997 to 2002 and identified albumin < 38 g/L and lymphocyte count < 700/mm3 to be independent predictors of 90DM. The same authors validated these predictors in a cohort of 128 patients treated with cytotoxic agents from 1986 to 1993 at a separate center . To date, no risk index has been prospectively validated to predict 90DM. 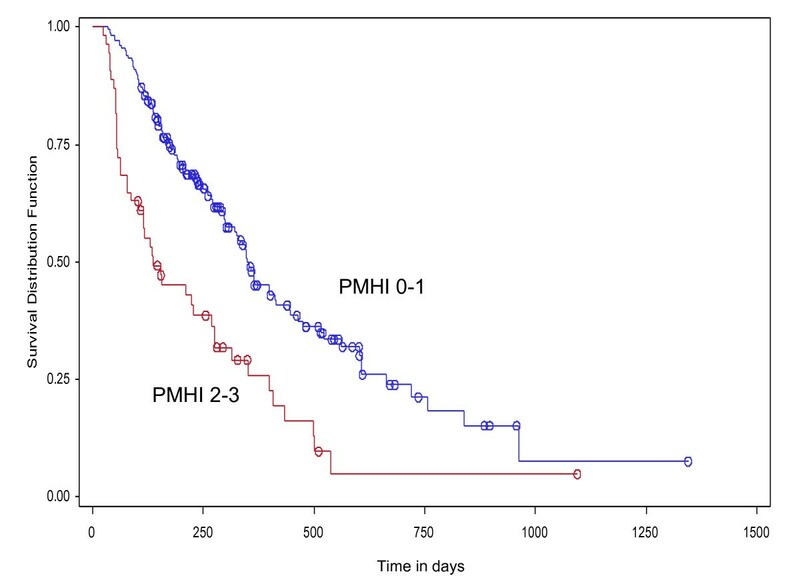 In predicting OS, the PMHI performed well but was slightly inferior to the RMI. The PMHI and RMI are similar in that they both include albumin < 35 g/L and number of metastatic sites. Compared to the RMI, the PMHI substitutes ECOG > 0 for LDH. Our findings may suggest that ECOG is an important predictor of early death within 3 months, whereas LDH, which reflects overall tumor burden, may be a better predictor of total disease burden and OS. The high proportion of patients with a good performance status in our study (ECOG 0 = 45%) compared to the initial study by Arkenau et al. (ECOG 0 = 28%) may have contributed to the importance of ECOG in our cohort. In predicting OS in our cohort, both risk indices were likely weakened by the inclusion of albumin < 35 g/L, which was not a significant predictor in multivariate analysis of OS. Albumin < 35 g/L, a marker of nutritional status, was present in only 3% of patients in our cohort, and therefore likely too rare to demonstrate an association with survival. In keeping with other studies, [6, 8, 9, 11, 12, 19] we confirmed that other baseline characteristics such as tumor type, number of prior therapies and older age, were not significant predictors of early mortality or OS. This consistent finding affirms that patients should not be excluded from enrolment in oncology PIT on the basis of age, multiple lines of prior therapy or primary tumor histology alone. Another interesting finding in our analysis is that patients with prolonged SD > 3 cycles had an OS similar to that of patients with PR, and a much better OS than patients with SD of 1-2 cycles and PD. This supports the notion of potential therapeutic benefit with prolonged disease control on contemporary PITs. Indeed, disease control (CR, PR and SD) has been associated with increased survival in patients on PIT . Disease control may be particularly important when evaluating new molecularly targeted agents that may exert greater cytostatic rather than cytotoxic effects. Our study cohort reflects a contemporary PIT patient population treated on modern and often complex phase I protocols. Over 95% of our patients were treated with novel molecularly targeted agents alone or in combination with cytotoxic agents. The median survival in our cohort of 10.7 months is longer than that previously published by several other PIT groups (5.7-9.0 months) [8–11]. The clinical benefit rate in our cohort of 56% is consistent with that reported by other recent studies (45-55%) [3, 7, 8, 20]. There are inherent limitations in this type of analysis. Firstly, the analysis was conducted retrospectively. Although the PMHI was able to identify patients with a greater risk of early mortality in a retrospective cohort, we recognize that our results need to be validated prospectively. Ideally, prospective evaluation of the PMHI should also occur in patients who are being screened for PITs in order to assist with patient decision-making prior to enrolment. Secondly, the study was performed at a single center in North America and therefore the PMHI should be validated across different centers, including those outside of North America. Furthermore, we evaluated patients enrolled in 30 different phase I trials. Although patient heterogeneity may be a confounder in our analysis, it is important to note that tumor histology was not a significant predictor of early mortality in patients enrolled on PIT in our study and previous studies [4, 6, 9]. Lastly, the findings of PMHI on 90DM should be viewed as exploratory. Given the relatively few number of events of 90DM to the number of predictors, potential bias and overfitting of data exist. A recent simulation study suggests that the commonly used 10:1 rule for the number of predictors per events may be overly stringent and can be relaxed . Therefore, our findings will require careful internal and external validation to confirm validity. Nevertheless, our study cohort represents the largest cohort of PIT patients in North America analyzed for predictors of 90DM. The PMHI and RMI are useful tools that can assist with patient selection for oncology P1T. In our cohort of unselected patients there were 33 deaths within 90 days of study entry (14%). Limiting patient enrolment to only those with PMHI score 0-1, would result in a reduction of 90DM from 14% to 5.6%. If enrolment was limited to patients with RMI score 0-1, the 90DM would be 9%. However, neither the PMHI or RMI alone is adequate to exclude patients from PIT entry due to the low positive predictive value which would restrict access for some patients who may have benefited. By excluding patients with a PMHI score of 2-3, we would wrongly exclude 34 patients (15%) from study entry, but prevent 20 early deaths on study. Whereas, by excluding patients with a RMI score of 2-3, we would wrongly exclude 30 patients (13%), but prevent 12 early deaths on study. Our findings demonstrate that a simple objective risk score consisting of albumin, number of metastatic sites and performance status, can be useful to assist in identifying patients enrolled on PIT who are at a greater risk of early death. This risk score needs to be validated prospectively in other centers. We wish to acknowledge all our patients and families, the Princess Margaret Hospital Cancer Registry and the Ontario Cancer Registry. NC participated in the study design, data collection, data analysis, drafted and revised the manuscript. AF participated in the data collection, data analysis, drafted and revised the manuscript. KC and LW performed the statistical analysis and revised the manuscript. EC, PB and AO participated in the management of study subjects, reviewed and revised the manuscript. LS participated in the study design and management of study subjects, coordinated the study, performed the data analysis, and drafted and revised the manuscript. All authors read and approved the final manuscript.